A butcher block countertop offers a traditional feel, often found on the kitchen island. While it can also be used for the rest of your kitchen countertops or any counters for that matter, butcher block countertops can be finished to match the wood flooring and/or cabinetry to bring the entire room together. Created from straight cuts of wood which are then glued together, these thicker slabs are known to create a smooth, yet sturdy surface for any type of kitchen work. Available in many grades of materials, its known to be one of the first types of countertops ever used in China and parts of Europe. The cost of butcher block countertops can depend on a few factors, including the type of wood being used, the finish, if it needs to be finished, the contractor and your geographical location. With all of these factors in mind, the estimates, from what we researched online, could range anywhere from $40 to $60 per square foot installed. While there are many factors, as you can see, we highly recommend you consider using the free quote tool, HomeAdvisor.com. With this tool, you can simply explain your job, and with this information, licensed contractors in your area will contact you with a no-obligation quote. This tool is great for those who do not have the time to compare quotes or do not know where to go to find one. As for just the installation, be prepared to pay a licensed contractor $55 to $85 per hour for their services, and on average, it will take an experienced contractor about one hour per 10 square foot of counter they have to install, including the planning, preparation and cleanup efforts. This time frame, however, can increase if the contractor had to cut out a sink as this type of counter has two seams, making the job more time-consuming. As part of the job, which will get into below, you may need to pay more for additional supplies required for the job, aside from the hourly rate. For just the butcher block countertop material, with on installation included, the average box at local retailers can cost about $175 to $350 per box for about a 70-90 inch long unfinished board. Kim Woodward at NewlyWoodwards.com talked about her experience with purchasing butcher block countertops at her local IKEA. According to her post, she paid $338 for a total of two slabs and did the installation on her own. Material and size – The two major factors, the material and the size, will be the largest factors that affect the total quote. Take a look at the type of materials available on the market and the corresponding prices in the table below underneath our next subheading to see what you should be prepared for just the materials only. Local labor – Local labor rates, as with any contract-based job, can greatly vary across the nation as someone in the middle of Iowa is probably going to charge much less than someone in Beverly Hills, California. Supplies – Installing a countertop is much more than just cutting a piece of wood and installing it. Depending on your final outcome, your contractor may need more than supplies than average, effectively increasing the costs. Improvenet.com, for instance, claims an average of $3.05 per finished square foot should be considered when you add in supplies such as the oil, sealant, bolts, screws, nuts and grout. Any additional costs? Do not forget to factor in additional costs such as permits that may need to be pulled, additional taxes and/or modifying/altering any HVAC, electrical and/or plumbing systems. Depending on your setup, you may find you may need to increase your budget by 10-20%. On the market, butcher block countertops come in three primary grades. The most common grade, known as an edge grain, is stronger, stable and is a lot less when compared to the other two. This type of grain will have long and narrower edges from the surface. The second grade, known as a flat grain edge, is laid out in a way so that the width of the board forms the surface, creating a streamlined look. Lastly, an end grain grade, formed with smaller blocks that often have more knots, is the strongest available but the most expensive option. - A variety of materials, finishes and colors, making it almost impossible not to find something you do not like. 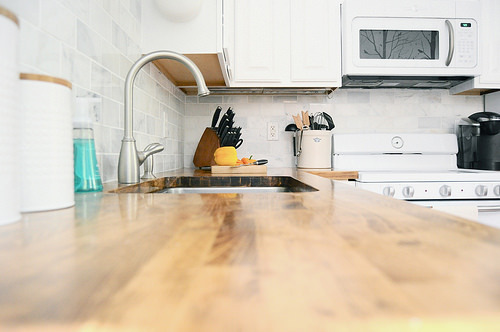 Any countertops made from wood will need regular care in order to keep it looking as fresh as possible. As they will be used often, experts recommend washing spills immediately after it happens, oiling the countertops at least once a month with a mineral oil and avoid using an acidic-based cleaning solution, such as vinegar, as it can often affect the glue holding the countertops together. Most of the butcher block materials noted above will be anywhere from 1.5 to 2.5 inches thick, with some higher-end options, such as cherry, being double this.